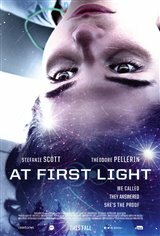 When high school student Alex Lainey (Stefanie Scott) has an encounter with mysterious orbs of lights that appear over her small town, she soon develops supernatural abilities. She confides in her friend, Sean Terrel (Théodore Pellerin), and the two go on the run when they discover someone is after Alex. As they run from the police and a covert government agency that wants to study Alex's powers, the teens find themselves thrown into dangerous situations. Sean must decide whether staying with Alex and discovering the truth behind her transformation is worth dying for.